Barry has studied the world as far back as Columbus and he is thinking FLAT (Fun Laminated Attractive Treasures). He has created decks of fun card magic with kids. Not every card has to be a playing card. Dig deep into a pile of pasteboard presentations, lasting laminates, and a fountain full of forces; so you’ll discover the magic of Kards with Kids. There’s so much content Barry wanted to cover that it took TWO DVDs to contain everything. PLUS the artwork is included for his original DIY effects. Soon you’ll be thinking differently about card effects with kids. 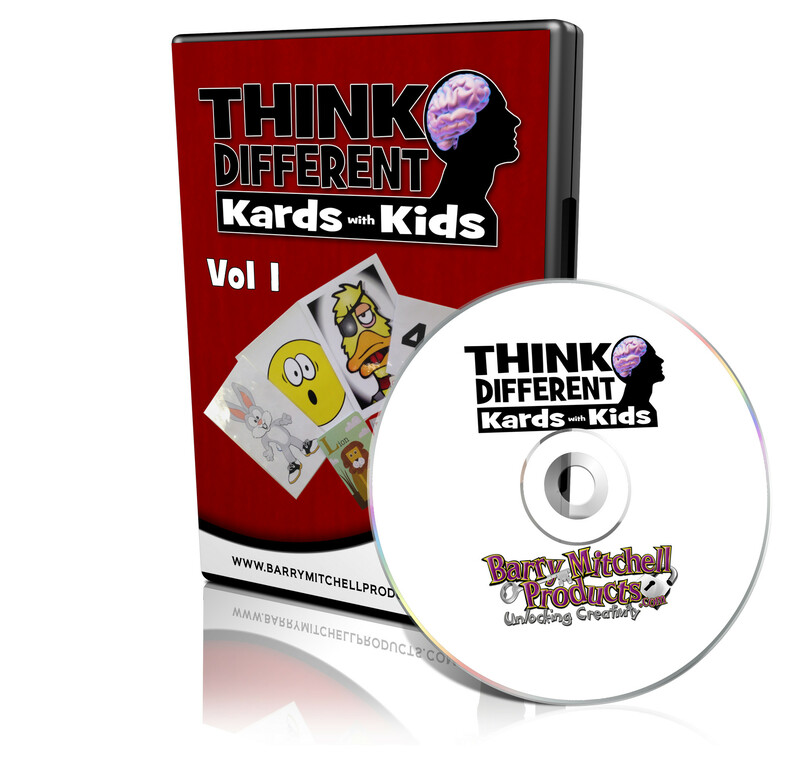 Barry Mitchell's Think Different is a series of DVDs that should be in every working magician's library. His newest, "Kards with Kids" is a home run. Let me give a quick review of Volume One. Even though I read the description on his web site, some how I was still thinking tricks using playing cards. So my first thought was: is this a kids version of Expert at the Card Table. No way is this about traditional cards. It's all about using large pictures, on large paper stock and most likely laminated. You use these to tell your story and perform your magic trick. The DVD is easy to watch, although I would have preferred to have a "play all" link on the menu. Barry explains all about paper and their differences in the very first chapter. This is really good information that should not be overlooked. The next chapter is all about forcing the right card. With 12 different forces being taught, no need to do the same force each time. they are all easy to learn and most of us will already have a working knowledge of many of these. Chapter 3 is Kards with Art. Now we are in the meat of the DVD with 6 different routines to learn and use. My favorite was Ryth-ma-tic Rabbit. But "Turn Your Frown Upside Down" can also be used in conjunction with his Smile Maker. Chapter 4 was a real bonus as Barry included his DIY Temple Screen instructions. His next trick is "What's For Dinner" and I can see me using this in my Monkey Business magic Show. But for Barry to include the complete routine and DIY instructions for one of his older products, "Elephant's Lost Key" was a real shocker. It is such a great trick, whether using it for a message, a gospel routine or just some magical silliness during your show. I believe Chapter 4 is worth the DVD alone. BUT WAIT... THERE'S MORE !!! Included is all the art work needed to make your own versions of everything he shows on the DVD plus complete instructions for the effects as well. All of this in PDF form. So it gets another rating of 5 stars from me. All this for $20... I just don't understand why he sells his genius so cheap.